The opening reception of Nikon Small World, the popular microphotography exhibit hosted every year at Wistar for the past 16 years, reminded us about the beauty hidden within the complexity of life. Guests enjoyed a first view of the gallery and a speaker program that represented different perspectives — and eyes — from behind the camera and microscope, and in front of the final images. 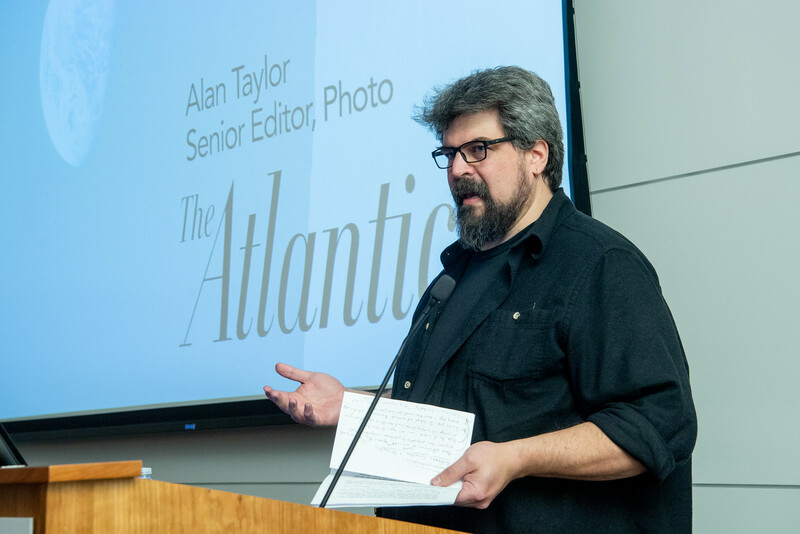 For Alan Taylor, senior editor at The Atlantic and a judge for the Nikon Small World international competition, photography is the bread and butter of his day-to-day work. He looks at thousands of pictures each day to tell the stories of what’s happening in the world. During his talk, he walked the audience through a sequence of compelling images to explain how beauty, and the stories being it, captures his attention as an editor and a judge for the competition. The first image was the famous 1968 ‘Earthrise’ photo taken by the Apollo 8 crew. As Taylor described it, it is the first look at ourselves from space. This photo was made possible by the work of thousands of scientists and engineers, and is the perfect example of how a wealth of scientific information allows for a moment of beauty to be forever captured for humankind to enjoy. Next was a picture of the universe taken by the Hubble Telescope, in which Earth is visible as just a minuscule bright dot, immediately followed by a photo that captured a single atom suspended in electric fields, also visible as a tiny dot. These two photos, juxtaposed, perfectly described how a single dot can epitomize our entire world and all we’ve ever known about it as well as the smallest constituent of matter. Taylor said he is drawn to images that evoke emotions and make viewers feel like they were transported. He picks images that illustrate connections between human beings and evoke empathy for the dignity of every human condition, such as a famous photo taken of a Syrian man listening to records and smoking his pipe in his bombed-out bedroom. Patterns and repetition are preferred themes, exemplified in a photo of the microscopic scales on a butterfly wing only visible through electron microscopy and an aerial view of a gigantic pile of yellow bicycles abandoned in a field in China. Images are powerful when they are able to tell stories. A self-proclaimed science fan, Taylor said that scientific imagery, in particular, brings people along on their own journey of discovery. Norm Barker, professor of pathology and art as applied to medicine at Johns Hopkins School of Medicine and a veteran winner in the Nikon Small World competition, spoke about his winning image of a human tear, how it came to be and how something as simple as a human tear can show a beautiful pattern when looked at and photographed in the right conditions. Barker said scientific imagery deserves to be on display in fine art museums and stressed how this exhibit motivates the young generations to become interested in the sciences. Michael Much, winner of an image of distinction, is a retired microscopist who dedicates his time and expertise to thoroughly extract images from specimens that attract his curiosity. His interests range from computer chips to tissue sections, from pharmaceuticals to insects, which he captures when they fly into his garage window screen and end up under his microscopic lens. Wistar’s James E. Hayden, RBP, FBCA, managing director of the Imaging Facility and also a regular contributor to Nikon Small World, closed the program and discussed his image of distinction, the fibers of a dandelion puff, which he generated while experimenting with a new Wistar microscope. Hayden also discussed the beautiful images of insidious diseases seen at Wistar, all in the pursuit of biomedical research discovery at the intersection of science and art. For an opportunity to be delighted by the beauty and learn the stories behind these images, pay a visit to see the fascinating photographs of Nikon Small World, on view at Wistar during business hours now through April 5 from 9 am until 5 pm. To see the gallery of winning images, including Honorable Mentions and Images of Distinction, visit nikonsmallworld.com.